“Within a tree, there’s a flower, within a rock, there’s a flame” is the dharma taught by Zen Master Dao, recalled by Most Venerable Thich Nhu Dien during his dharmic teachings to which I had good fortune to attend in his dharma-propagating journey to the United States of America in 2006 when I acted as an assistant to him. Zen master Dogen, a Japanese, was born in 1200 and reached parinirvana in 1253, when he was 53 years-old. He was the first patriarch of Soto-Zen), also an author of the popular book titled, “The Right Dharma Eye Treasury”. He educated, “Ki no naka ni, hana ga aru (Within a tree, there’s a flower);Ishi no naka ni, hi ga aru (Within a rock, there’s a flame), was translated into Vietnamese by Most Venerable Thich Nhu Dien. The verses sound extraordinary. They are succinct, but well associated with profound Buddhist knowledge on causes, conditions and fruits. “Within a tree, there’s a flower” is the root cause, then comes a flower, as it has its all right conditions. It implies that when all its right conditions could be considered as right care taken, supported by the right weather, flowers are coming into bloom. For instance, Japanese cherry trees and Vietnamese ochna integerrimas are likely to produce flowers when the spring comes, but without right care, fertilizer and water supplied at all, they could hardly give rise to “beautiful” flowers. Within a rock, there’s a flame is the root cause. Flame occurs as its all right conditions are available. These all conditions could be understood that two rocks rubbed each other hot enough is to create a flame. On contrary, it is impossible to give rise to a flame when two rocks are put apart. His implication was that “Within a being, there is Buddhata”, but this Buddhata has been hidden by avidya sustained from the beginning. In order for this Buddhata to be exposed in the present incarnation, such avidya needs to be eradicated through one’s right efforts put in cultivating the mind every second or restlessly, in the same way as the two rocks are continuously rubbed hot enough to produce a flame. If rubbing is not long enough or discontinued, flame could not be produced. Thus, laxity of self-cultivation is given or no right and strong efforts are made to eliminate one’s distress and delution (bad karmas), one’s Buddhata is never seen. “Within a tree, there’s a flame ” is a typical image attached to Most Venerable Thich Như Dien’s life-long cultivation and Buddist-dharma propagation to benefit all beings. Most Venerable Nhu Dien is always a bright example of restlessness and right, strong efforts made to his cultivation on the noble path for the descendents to follow. It was fortunate for me under Most Venerable’s permission given to accompany him for his Dharma-proclaiming journeys to the United States of America. It was my luck to pay several visits to Vien Giac Temple in Hannover. It was also my pleasure to get in touch with and act as a trusted servant to him on his visits paid to Quang Duc. Prostrating before the Buddha has been recognized as Buddhist practice to repend of one’s sins or wrong-doings through which their bad karmas could be removed or reduced. Additionally, this practice could help purify one’s body and mind via body, speech and mind karmas. Most Venerable Nhu Dien has vowed to kowtow to the Avalokiteśvara or Padmapani’s 500 names Sutra; the three thousand Noble Buddhas Sutra (the Buddhas of three generations – past, present and future Buddhas). Then, Sir Nhu Dien has also vowed to bow down to the ten-thousand Noble Buddhas Sutra from which 10,000 prostrations (Pali: panipāta, Skt. : namas-kara,) have been performed. During the three-month-summer retreat (known as Varsa), Monastery. Therefore, it is safe to say that I have witnessed and known the ins and outs of Most Venerable’s life-long cultivation. During his 55 year-practice no matter where he is, he has never quitted the early morning prayer session except for his illness. Most Venerable Thich Nhu Dien is well-known for his Buddha-postrating vow, as his strong vow has been again made to prostrate to each word of the 70,000-word-Suddharma-Pundarika Sutra or The Lotus Sutra (Vietnamese version). Sir Nhu Dien and his followers have also been kowtowing to each word of the 4500 page Maha-Parinirvana Sutra or Great Nirvana Sutra (Vietnamese version). My anticipation is that such practice is not completed until the mid-2019. Sir Nhu Dien said, “Since 1984, he has performed 250-300 prostrations every evening. Obviously, in the modern world, nobody can measure up with him in this respect. Sir Nhu Dien said, “Thanks to reciting the Buddhist Sutras and prostrating before the Buddhas, many Buddha-affairs of mine have been marverlously completed.” In other words, through merits and virtue achieved from his every-minute practice, his various Buddha-works have been excellently undergone. Most Venerable Thich Như Dien is the second President of The Unified Vietnamese Buddhist Congregation of Europe, and also a Deputy President of the World Association of Sangha located in Taiwan. Most Venerable Thich Nhu Dien was born on the 28th of June, 1949 at Duy Xuyen rural district in Quang Nam. He was ordained to the Buddha in 1964 at Phuoc Lam Patriarch’s Temple in Hoi An, an ancient market-town, Quang Nam province. He was ordained to be a novice disciple in 1967 by Pho Da Temple Triple Platform Ordination in Danang. His then dharma name was Giải Minh (‘clear explanation’ is the one of various meanings from this term) by the late Most Venerable Thich Long Tri. In 1971, he became a fully-ordained monk at the Formal Ceremony of Ordination held at Quang Duc Monastery in Thu Duc. In 1972, he was awarded an overseas study grant by the Unified Vietnamese Buddhist Congregation of Quang Nam in the agreement of Central Buddhist Association through the references made by Most Venerable Thich Huyen Quang and Most Venerable Thich Thien Hoa, the then Chairperson of the Institute of Buddhist Instruction and Guidance. He went to Japan for his study pursuit. In a period of nine months, he passed three Japanese language courses and was admitted to pedagogy school of Teikyo University in Tokyo. In Febraury, 1977, he graduated with the highest academic achievements, and moved on to the post graduate Buddhist study at Risso University, Tokyo after passing the admission examinations, but his study occurred over there for a short time only. On the 22th of April, 1977, he came to Germany with a travel visa. Then, he took official refuge granted by the German government. He has lived there and has not returned to his homecountry since then. He stayed in Kiel and learned German at Kiel University for one year before moving to Hannover to pursue post gradudate education study. On the 15th of April, 1978, he formed Vien Giac Buddha Recitation Hall in Hannover. In 1988 he was recognized as Senior Venerable by Great Vow Formal Ceremony of Ordination held at Lotus Dharma Temple in Marseille, France. On the 28th of June, 2018, He was ordained by the Unified Vietnamese Buddhist Congregation of Europe as Most Venerable at Phap Chuyen Formal Ceremony of Ordination held at Vien Giac Temple, in Hannover, Germany. On the 8th of July, 2011 in Colombo, Sri-Lanka, Most Venerable Thich Nhu Dien was awarded the Noble Prize by Sri-lankan Prime Minister for his merits on the world-wide Buddhist propogation recognized by Sri-lanka’s Council of Sangha. So was Most Venerable Thich Minh. Most Venerable also acted as a founder of the Unified Vietnamese Buddhist Congregation of Germany, Vietnamese Student and Overseas Buddhist Association of Germany in 1978 & 1979. There are currently 15 Buddhist temples all over Germany, comprising 70 monks and nuns together with 23 branches and seven Buddhist Associations. 2018-2019 is the time to celebrate 40 years in establishing the Unified Vietnamese Buddhist Congregation of Germany, a national branch, and also to celebrate 40 years in running the Vien Giac Magazine. The fact is that there have been three abbots in charge of Vien Giac Temple, Hannover as shown as follows: Most Venerble Thich Nhu Dien, the 41th embracer of Lam Te Zen, Chuc Thanh, was a founder of Vien Giac Temple in charge of it from 1978-2003. Following the founder was Senior Venerable Thích Hanh Tan, who took the first abbot’s role from 2003 to 2008. The second abbot was assigned to Reverend Thích Hanh Gioi from 2008 to 2017. The current abbot has been appointed to Reverend Thich Hanh Bon since 2017. Vien Giac is one of the famous Temples in Europe, which started being built in 1889 and was augurated in 1991. The completion ceremony was held in 1993 with the construction cost of €9,000,000 ($ 5,000,000). Every year, Vien Giac Temple hold various Buddhist affairs for Vietnamese fellow-country people and native Germans, namely, Vesak or Buddha’s Birthday Aniverary, Filiality Ceremony, Avalokiteśvara or Padmapani’ s Ceremony, Lunar New Year Festival, First Full Moon Festival alongside short time and long time retreats lasting from two days to three months. By my estimate, the number of Vietnamese people that go to Vien Giac Temple every year could have reached 80,000, compared to 40,000 native Germans approaching the Temple to familiarize themselves to Buddhism. It could be said that Vien Giac is the first Vietnamese pagoda established in Germany, and it has become the Partriarch’s Temple of the Chuc Thanh Sect in particular and for Vietnamese people in Germany in general. Not only has Most Venerble Thich Nhu Dien’s Buddhist propagation been undertaken within Germany, but also it has reached overseas. Most Venerable Nhu Dien could be the first overseas Vietnamese monk holding the record for having travelled to the most countries since 1975, including 73 nations, particularly Europe, East Europe, North Europe, The United Nations of America, Canada and Australia where he frequently come and go for preaching the Buddha’s Dharmas. The country that is the most familiar to him is Australia, as this place of Kangaroos is being dwelt by his bloody and dharma brother, Most Venerable Thích Bao Lac (current Chairperson of the Unified Overseas Vietnamese Buddhist Congregation of Australia and New Zealand), especially resided by his Dharma instructor, who was the very late Most Venerable Thich Như Huê (1934-2016), a former leader of Buddist Association of Australia for 16 years from 1999 to 2015. Based on the references made by Most Venerable Thich Nhu Dien, the Vietnamese Buddhist Community of Adelaide respectfully invited Most Venerable Nhu Hue to Australia to reside for long and preach the Buddha’s teachings until he entered the nirvana. According to the Most Venerable, 1979 was the first time that he set foot on Australia pursuiance to the respectful invitation made by Vietnamese Buddhist Association of New South Wales to give some Buddhist instructions and advices on how to get involved in Buddhist activities. On the other hand, he also encouraged the Association members to make their own monthly donation of 10 AUDs through which the Association could maintain its activities in the long run and/or hire premises. The fact is that Most Venerable Thich Bao Lac, his brother, is the abbot of Phap Bao Temple in Sydney. This could be the main cause of leaving Germany in every cold winter for Australia to visit his brother for two months, following his one-month stay in other Asian countries such as Thailand and India since Most Venerable Nhu Dien became the Head of Vien Giac Monastery in 2003. His brother and he frequently went up to the Da Bao Hill spending their retreat for two months on end. 2012 was a ten-year milestone in his extremely peaceful and joyful practice performed on the Da Bao Hill situated in Cambelltown or Blue Mountain. Besides writing or translating Sutras and/or dharma books, he together with his brother spent some time travelling here and there around Australia. For instance, in late 2006, Most Venerable Nhu Dien had his visits paid to Darwin, Perth, Aluce Spring and Uluru (Red Rock), one of Australia’s recognizable natural landmarks. Uluru is generally viewed as a large sandstone rock formation, which is barren, that is, there are no trees and nor plants all over the rock. Uluru stands 348 metres in height and three kilometers in length, and it has a circumference of 8.5 kilomtres at its foot. For sightseers, everything appears to be seen as tiny in such a giant sandstone formation. Most impressively, Uluru is famous for appearing to change colour, such as dark red, orange-yellow, green, violet at different times and weather conditions of the day. The sacred rock is estimated to be 600 years old. It is characterized as dark red, but it is turned to other colour in accordance with the weather. During his visit in 2006, Most Venerable Nhu Dien also spent three hours in walking in meditation around such a sacred sandstone formation. In late 2010, I invited Most Venerable to visit to Tasmania following his attendance at and instruction for the 9th cultivation class held in Sydney. His companion, Rev Hanh Dinh and he left for Melourne joining me and my Australian disciple, Quang Tu Chris Dunk to get on the Spirit Tasmania ship to start a journey. The reason for choosing Tasmania is that I wanted Most Venerable Nhu Dien to visit Port Arthur, a small town, which used to be a prison located on the Tasman Paninsula. Pursuant to the media news, this place was officially listed as a UNESCO World Heritage Site in 2010, alongside the other 11 places used as a chain of jails by British Empire in 18-19th centuries. Nowadays, Port Arthur is one of the most popular historic relics in Australia, appealing to over 250,000 sightseers each year. During our tour to Tasmanis, Most Venerable and I discussed something regarding Buddhist affairs of the Buddhist Congregation, Buddhist propagation, particularly book translation plans for the near future. All of a sudden, right after the journey, the co-translation was started with two English books, which was transcribed into Vietnamese. At first, I respectfully requested Most Venerable to co-translate the work titled, “Buddha & His Principal Disciples’s Relica”, but to my notice, it had been already translated into Vietnamese. Then, I politely asked Most Venerable to co-translate the work,“Peaceful Death, Joyful Rebirth” written by a Tibetan Lamas, Tulku Thondup (Nyingma Sect). This book is 515 words in length. I translated five chapters from chapter one to chapter five while Most Venerable transcribed the other five chapters from chapter six to chapter ten and two appendices. Through the co-translation of this work, I would like to provide a supplement about the Tabetan Buddhism to the Vietnamese Buddhist archives, as this book is regarded as a ‘gathering point’ of the wisdom of the Tibetan Buddhism accumulated and refined for thousand years, focusing on the fundamental teachings on The zen sect, the Mantrayana sect and the Sukhavati sect (the Pure Land sect). Not only does it show how to treat our suffering and eliminate delusion about death and dyingness, but also it could help us to reach supreme bliss both for the present life and for life after death. The second book titled, “The Zen of Living and Dying – A Practical an Spiritual Guide”, was co-translated with Most Venerable Nhu Dien and published on the 17th Buddhist Practice Class held in December, 2017 at Portsea, Australia. My translation was made from the first page to page 136 while the rest from page 137 to page 251 was transcribed by Most Venerable., The English version was originated from American Zen Master, Philip Kapleau (1912-2004), who was the popular author of the work, “The Three Pillars of Zen”. I presented to Most Venerable the reason why I chose to translate this book, as it was related to Japan where he used to study from 1972 to 1977, while Senior Monk Philip Kapleau was the deciple of Japanese Zen Master Bach Van. Philip Kapleau came to Japan in March, 1947 to work as a secretary for the International Military Court in Tokyo trying the the Second World War criminals. In his comparison with trials for Nazi terrorists undertaken in Nuremberg, the hearings held in Tokyo were easier and less tensive, as Japanese people were calm and in control of accepting the consequences brought about by the war. From his knowledge acquired from “The law of karmic retribution”, Kapleau found that Japanese people accepted the bad retributions. The law of causes and effects closely involved in morality seemed to catch Kapleau’s attention, contrasting with the defence frequently heard in Germany. His curiosity of the karma law finally encouraged Kapleau to embrace Buddhism, then he quitted his job and was ordained to Japanese Buddhism. Various books on death and dyingness have been available for the time being. Another supplement to this matter is a question that needs to be explained as follows: The aim of the work, “The Zen of Living and Dying” is to show a reader how to lead his whole life at any time and to have a peaceful death whenever it comes. This awareness will make us ready for fearlessly challenging death and calmly accepting anything regarding death when it occurs to us. In other words, it is the process of replacing worn-out and out-of-date body with a new one. Most importantly, dyingness is the very unique chance of the whole life that we have to experience emancipation or enlightenment. These two works co-translated by Most Venerable Nhu Dien, (teacher) and me (his student), have had a compaign launched to raise fund for publication and worldwide distribution in Europe, Australia, the USA and Canada. I would like to take this chance to express my huge thanks and gratefulness to Most Venerable Nhu Dien for doing me a favour by cooperating with him in creating these two spiritual works of value. As for his tranquil retreats in Australia, the ten-year milestone has witnessed his 20 supplements to Most Venerable Nhu Dien’s archives of 65 (authored and translated) works. Additionally, Most Venerable has also made significant contributions to the Buddhist Practice Classes held at Australia. In general, Australia is the country that Most Venerable has been to the most in his life. He told me that his journeys taken by plane to Australia have covered the distance of over one million kilometres, as 38 flights between Hannover and Sydney for 38 years (from 1979 to 2017) have reached 1,292,000 kilometres, as Hannover is 35,000 kilometres away from Sydney as the crow flies. Second to Australia is the United States of American that Most Venerable very frequently approached to preach the Buddha’s teachings. In fact, in 1979, Most Venerable Nhu Dien started to fly to the USA. Up to 2018, for nearly 40 years on end, Most Venerable has had 50 journeys to this country for the Buddhist affairs. This implies that he took his trip to America nearly every year. If he did not fly over there in a year, or alternatively, in another year, he made two or three flights to this country whether to give Buddist instructions or whether to attend an inauguration ceremony, or whether to attend a monk or nun’s funeral. It would be impossible to withstand the pressure and tension brought about by travel and work for ten weeks on end if nobody from the delegation were healthy enough. Most of the cities and states, which the delegation set foot on, had monkless or nunless temples. So, the home Buddhists were hungry for the Buddha’s teachings on which they rely to cultivate themvelves to reach emancipation or enlightenment. 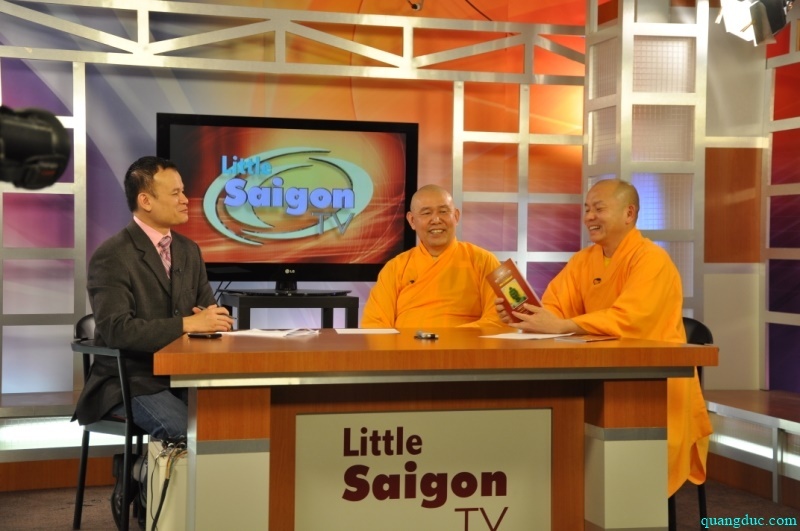 The delegation was interviewed and the news on the delegation was published by the local media in Santa Ana such as Little Sai Gon Television (Đoàn Trọng Reporter, Phạm Khanh Journalist); Viễn Đông Newspaper, The Sai Gon Times about the current situation of The Unified Vietnamese Buddhist Congregation, and the delegation’s Buddhist propagation. Moreover, Kiều Mỹ Duyên radio reporter, Mr and Ms. Trọng Nghĩa-Mộng Lan undertook direct interviews with the delegation about various aspects from the Buddha’s dharmas – preaching journey. California Today Viet Nam Television in San Jose managed by Mr.Nam, also took a media piece accompanied by interviews with the delegation on something regarding the Congregation and delegation. Indeed, reaching the age of 70 has long since been rare for worldly human-beings. No matter how lucky they are to be 70, they have been engulfed in the world affairs, which are always changing up and down, resulting in their suffering. They are always burying themselves in reputation, social positions, food & clothing, money and so forth without any days when they are at ease, in happiness and in peace. As for Most Venerable Nhu Dien, he is reaching the age of 70. Up to now, his life could have been considered as an integral journey that looks marvellous, thoroughly clear and magic. This has been reflected through the following facts and figures: His 70 years to dwell in this world; 55 years to be ordained to practice dharmas and to preach the Buddha’s teachings; 40 years in establishing and managing Vien Giac Temple in Germany; and 40 years to join the noble monks and nuns to turn the wheel of dharmas. Obviously, his life is a very bright example of his virtue and life-long propagation merits. He is always showing his lifestyle as a devout monk, closely characterized as content with few desires, pure virtue of morality attached to his daily practice, his book-writing career; translating, printing and distributing Buddhist works; publishing the Vien Giac Magazine, instructing Buddhist clergy, maintaining a devout monk’s lifestyle in accordance with precepts; preaching the Buddha’s teachings and rescueing all being to free from delusion; establishing Bodhi-mandalas; and preserving national culture. He has ordained 45 disciples, and let 7000 home Buddhists take refuge in the Buddha, the Dharma and the Sangha. All of them have had a joy of hearing and tasting miraculous dharmas given by Most Venerable Nhu Dien. No word in my language store can describe his life devoted to the propagation of the Buddhist dharmas and to helping others to liberate from delusion. It has been told that all of his very dear disciples from Vien Giac Temple in Hannover, Germany have been making prepations to celebrate his 70th birthday anniversary in the 2019 summer. May we presume to have these words to eulogize Most Venerable Nhu Dien’s every-second practice and merits that you have devoted your whole life to preaching the Buddha’s dharmas and helping beings from delusion abroad. May we prostrate before you. May we wish you good health and peaceful mind with unhindered dharma-causes.